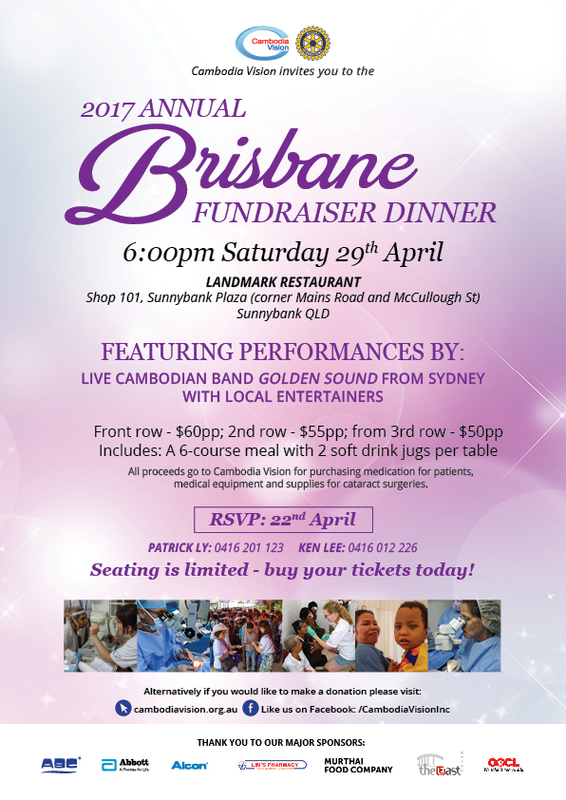 Cambodia Vision invites you to the 2017 Brisbane Fundraiser Dinner for an evening of fun and entertainment at Landmark Restaurant, Shop 101, Sunnybank Plaza, Sunnybank, QLD. There will be performances by Cambodian band Golden Sound from Sydney with local entertainers. Funds raised through ticket sales and auction items on the night will go to Cambodia Vision for purchasing medication for patients, medical equipment and supplies for cataract surgeries. Tickets: Front row $60pp, 2nd row $55pp, 3rd row $50pp. If you would like to make any general donations please contact the Brisbane volunteers above.